As the library's selector for the teen collection, I read a lot of YA novels. As much as I love reading and sharing what's brand new, I also like shining a spotlight on some of the titles that have been hanging out on our shelves for a while. 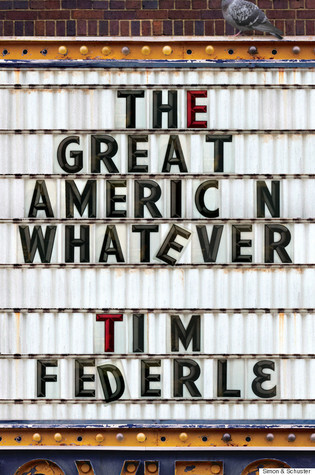 This month, I'm taking a a look back at Tim Federle's debut YA novel, The Great American Whatever. I really enjoyed Tim Federle’s two middle grade novels, Better Nate than Ever and Five Six Seven Nate! and I was happy to hear that he was trying his hand at Young Adult. After reading The Great American Whatever, I wasn't disappointed! I’ve never experienced a loss of a sibling, but Tim’s characters illustrate exactly how I’d imagine it would feel. Protagonist Quinn and his mother pretty much give up on everything after Quinn's sister, Annabeth, dies in a car accident. Quinn sticks to his room and gives up on writing; his mother sleeps on the sofa and overeats. Her death has affected them deeply. The novel starts with Geoff, Quinn’s charming best friend, encouraging him to go a college party where not much happens, other than Quinn meeting this hot guy, Amir. I really appreciated that Geoff and Quinn’s relationship is a positive example of a straight guy being friends with a gay guy – even if the straight guy does disgusting things like name his farts. Quinn isn’t quite out of the closet – he hasn’t told his mother – but the story isn’t centered on that. Quinn’s developing relationship with Amir, his dealing with the events that surround his sister’s death, and his finding his way back to his passion is then the focus of the story. Quinn and Amir’s relationship starts out healthy, but it’s evident that they both have different ideas of what they want out of it and its direction. I’m not sure I’m happy with where it did go – but not all relationships go the way we want them, do they? Overall, this is a great story about coming to terms with loss, believing in friendship and discovering self. Quinn may come off as smart aleck, but he warms up quickly and you'll care about his journey. - William Ottens is the Cataloging & Collection Development Coordinator at Lawrence Public Library.